I hadn’t really intended to do any baking, but I was at home with my kids and my son was asking if we could bake something. So after having a hunt through one of my recipe books, I found a couple of things I had the ingredients for. I asked my son which he would prefer to make, and he chose ladybird cupcakes. I was worried he had picked them because of the red ladybirds (red being his favourite colour) The only thing I didn’t have was red icing (although I had a myriad of other colours to use up). I warned him this was the case, and he didn’t seem to mind. 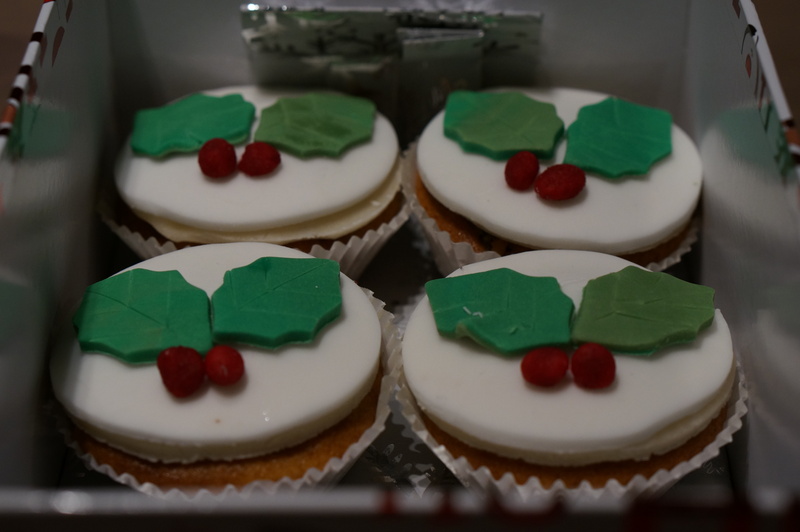 The cakes themselves were incredibly easy to make – just your bog standard vanilla fairy cakes. The icing wasn’t too tough either – good news for us, as my son is only three. In order to make the ladybirds, we cut out circles of skin-coloured icing and fixed them to the top of the cake. Then we used chocolate-brown icing to make heads and the spots (by squishing small balls flat), and the tails (by rolling small pieces into tubes). We used tiny pieces of white icing for the mouths, and I happened to have some of those tiny necklace sweeties hanging around, which made great eyes. Not a difficult bake, but the end result was pretty effective. And if you have a fairly patient and willing three-year-old, this is one they can help with! 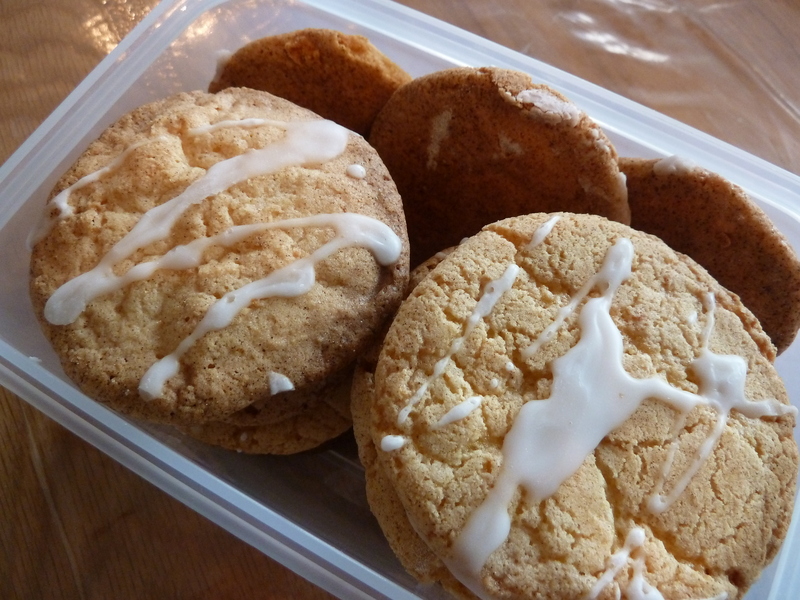 Another recipe I made for when we headed back to see our families for the weekend (the same weekend I made the Mothering Sunday sweets and the Easter bonnet cake), these were made to take to hubby’s family, and not as a birthday present. Once again, they were pretty easy to make – a simple dough mixture with some lemon zest added in. The dough was then broken into walnut sized balls (or, when I got bored, slightly larger balls) and baked in the oven for about half an hour. Once the biscuits were baked and had cooled down, I then added some lemon icing (made by mixing icing sugar and lemon juice together), just to make the biscuits look a bit more interesting. Of course, my 2 year old then asked for one without icing (he is a little odd) which I no longer had… but that did mean more the rest of us, and they were rather tasty! Another recipe that I made for my mum’s birthday, even though it’s officially an Easter recipe. I’ve been wanting to make this for ages (it looks good in the photos, and sounded pretty easy to make considering the potential end result), and messing up the rest of my mum’s present (basically I ordered the wrong thing) meant it was a good excuse to make this. The cake itself is simple – it’s just a basic lemon sponge cake. The only difference is you bake it in a Pyrex dish so that it gives the right shape for a bonnet. It’s the decorating that takes time. You place the cake on a circle of icing, then cover the cake with icing after you’ve used a cake cooling rack to mark out squares. 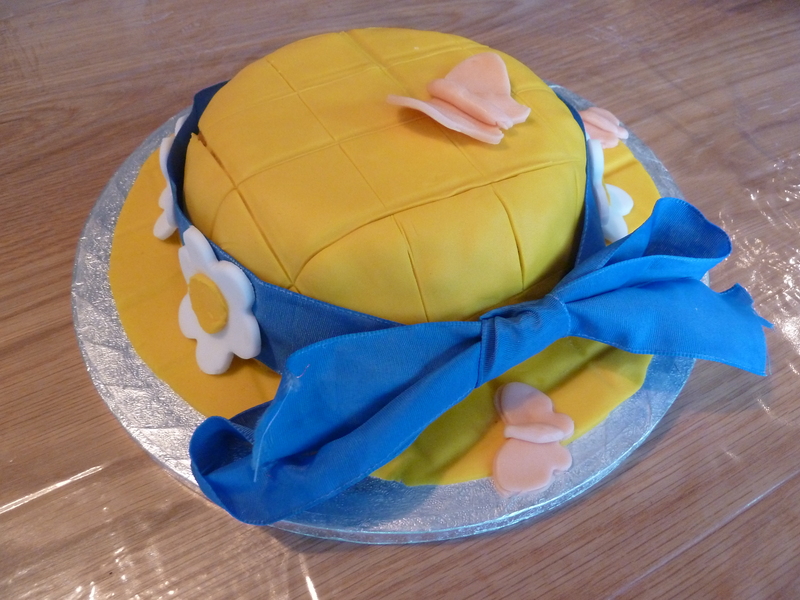 You then make flowers out of icing to place around the edge of the cake, and tie a ribbon around the bottom of the cake (which is a great device for hiding the joins in the icing!). Finally, you can create some icing butterflies to add to the cake. All relatively easy if you have the right cutters – which, for the most part, I did. And I was relatively pleased with the end result. Unfortunately however, unlike the Mothering Sunday sweets, I didn’t get to try any of this (when offered, I foolishly went for the flapjacks. Yes, they were good – but I know what flapjacks taste like), so I can’t say if the cake was tasty or not. My mum told me it was good though, so I guess I’ll choose to believe her. As with all traditional Christmas cakes, I started making this at the end of October, two months before it was due to get eaten. Well how else do you achieve that amazing boozy taste?! This is a fairly traditional Christmas cake (there’s a clue in the name), where you soak the fruits the night before, then mix them in with the sugars, flours and treacle etc, then bake the whole heavy thing in the oven for about 4 hours. It really does make the house smell amazing though. You then spend the next 6-8 weeks feeding the cake with sherry/ brandy/ rum/ whatever you prefer (you can use orange juice, but I don’t see why). My drink of choice this year was sherry. A couple of weeks before Christmas I then covered the cake with marzipan. I have to admit that I didn’t do a fantastic job (the sides in particular looked somewhat patchy), but I wasn’t too worried as I knew a week later the cake would also get covered in icing. And so it did. I put off covering the cake with icing because I knew I was being fairly ambitious in what I wanted to do, so it took me a couple of days to build up the courage (especially as I had messed up the marzipan so effectively). In the end I didn’t do a bad job, although I do think a little less may have looked better. I added snowflakes (using my shiny new snowflake cutters) to the sides of the cake, separating them with smaller snowflakes and silver balls. Overall the whole thing looked OK, but perhaps it didn’t need the Christmas tree. Just snow flakes and holly would probably have looked more professional, and a bit more classy. 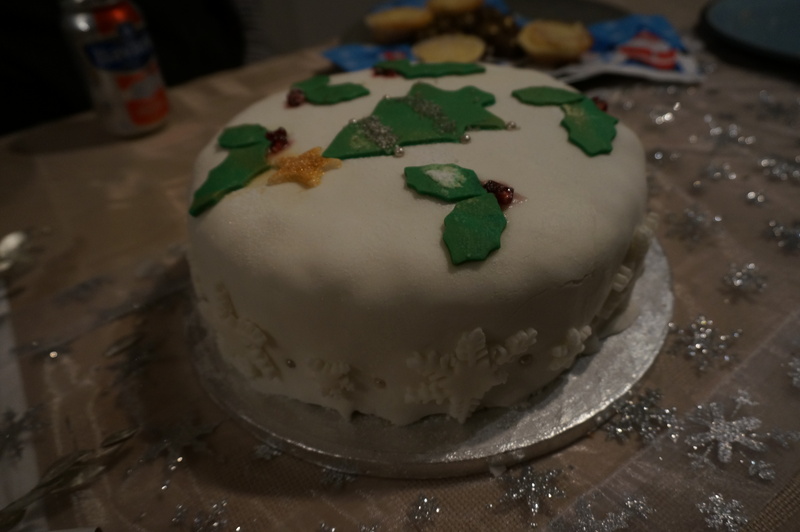 However it looked, it tasted pretty good – nobody who likes Christmas cake complained anyway! Along with another batch of my eggnog cupcakes, I decided to make some mini Christmas Fairy Cakes as a gift for a family member at Christmas (I can post this now because I gave him his gift yesterday, and from the size and decor on the box he knew damn well what it was – he gets a similar gift every year). The cakes themselves are basically a gentle version of a Christmas cake. They contain flour, eggs and butter. But the sugar is light muscovado sugar, and you add mixed fruit and almond extract. You can also add mixed nuts, but to me that just ruins the taste. They smelt amazing in the oven, and taste like Christmas, but a bit lighter. To decorate the cakes firstly I drizzled them with brandy and added some apricot jam. Then I cut out a circle of marzipan, then placed a circle of royal icing on top. The recipe actually states to make runny icing and coat it with that, but I think ready-made royal icing looks better. I then cut two holly leaves per cake out of green ready-to-roll icing, and coloured some marzipan red to make holly berries. These are then all placed on top of the white icing (I say ‘I’, actually my 2-year-old son helped with the rolling and cutting and, I have to say, did a damn good job!). I was pretty pleased with the end result, both on terms of the way the cakes looked and tasted. I hope they are enjoyed as much by the receiver of the gift! Whilst this is a Christmas recipe, I didn’t make it for Christmas itself. I wanted to use it as a test run for a bake that I would potentially make somebody as a Christmas present. As it happened, it worked out well because my family decided to visit right over the weekend in November that I made these bite-sized cakes, meaning they had somebody to eat them! The bites themselves taste OK; you make them in a similar way to normal Christmas cake, by soaking apricots in alcohol for a day or so, then adding lots more fruit, sugar and flour to the recipe. You then bake the traybake for an hour or so before covering it with marzipan and icing. What you don’t do is leave the cake for weeks soaking up the additional alcohol you add to it – which, it turns out, is exactly what makes Christmas cake taste so good. These little bites are serviceable enough, but somehow lack that excess that ‘real’ Christmas cake provides. I decided they weren’t quite special enough to get upgraded to present status. The second visitor was my friend Emma. 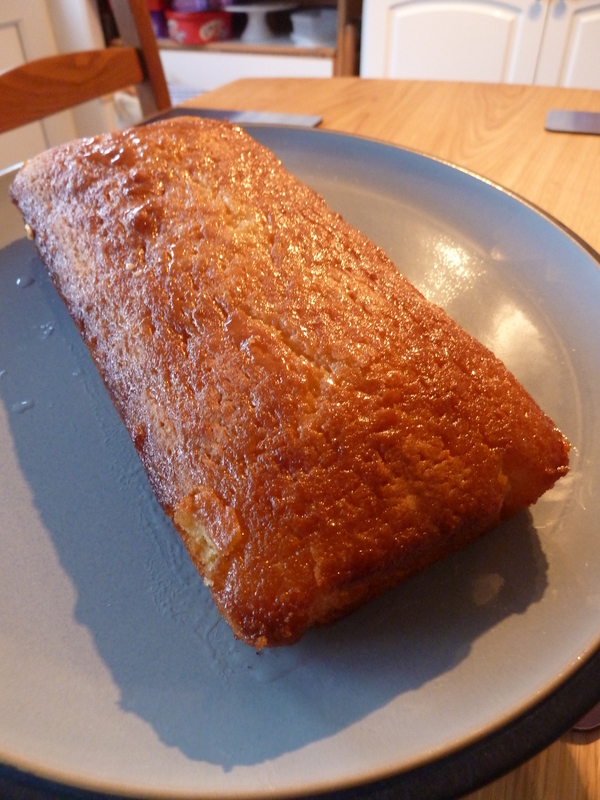 It had been a pretty busy week, and she was only here for a couple of days, so I didn’t do anything fancy, but I did decide to bake the August recipe in my Home Baking 2014 calendar – a lemon drizzle cake. As it transpired, Emma didn’t actually eat any of the cake. But it was easy to make, traditional and super tasty, and hubby and I happily chomped our way through it in a matter of days (or perhaps that should read minutes). There really wasn’t anything hard or fancy about this cake – you make a basic sponge, add lemon zest to it, then add lemon icing to the top of the cake. Lemony and light, it was truly lovely and easy to eat. Last Christmas, my mum bought me Debbie Brown’s “50 Easy Party Cakes”, which I had seen on display and decided might be a good book if I ever wanted to decorate a fancy cake. Well, I decided this weekend was my chance. We had a group of friends we don’t see very often visiting for a barbeque, and one family had just had a baby boy. 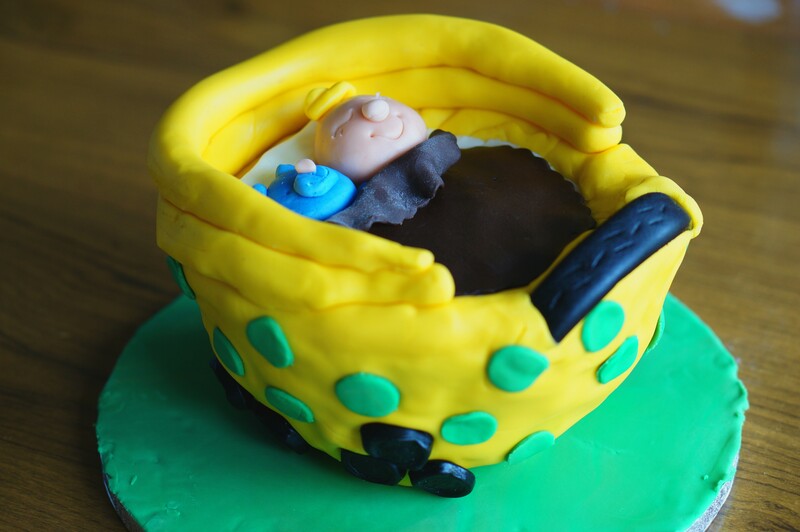 So I figured a “Baby in a pram” cake was a good choice – and it didn’t look too difficult to do. The actual cake wasn’t that hard to make – the toughest part was ensuring it was cooked all the way through as it was so much bigger than a normal cake I would make; and bowl shaped, which is also a bit different to normal. The real challenge came with decorating the cake – as I knew it would. The hardest parts were, unfortunately, the first things I needed to do. That w as covering the cake board with a thin layer of sugar paste, and covering the cake with sugar paste to create the pram. The cake board worked out OK, but there were quite a lot more bumps in the pram than I would have liked. However, I think I did a better job of the other parts. I made a pillow, a teddy bear face, a baby’s face, a blanket and a hood to the top of the pram. The baby’s face took two attempts but worked out OK. I was especially proud of the teddy bear! I then added a liquorice stick and wheels for the wheels and handle of the pram. Finally, hubby and I stuck small circles of icing on to the pram, which we used to cover up the worst of the cracks and bumps. Overall, I was fairly proud of the cake – most people made positive comments, and almost everybody had a slice and finished it. Which I hope means they enjoyed it and weren’t just being polite about it! I don’t think it was bad for a first effort and would attempt something similar again – when I have time. I took one evening to bake the cake, one to cut it up and sort the buttercream out, and another 2 hours on the final evening to actually decorate the cake. I knew that would be the case so it was fine, but this isn’t something I would be willing to attempt when feeling stretched for time! Another recipe to appease my parents over the Mothers Day (and my birthday) weekend, and also inspired by Mary Berry Cooks, this was one I also wanted to try. I wanted to try it for two reasons – because I love chocolate cake and it looked amazing, but also because I wanted to have a go at the feather icing. As I mentioned when I wrote about the fairy feather cakes I made back in February, I’m still experimenting with a new type of icing bag – one where you throw the bag away after use, rather than the plastic reusable kind. It sounds wasteful, I know – but they are so, so much easier to use than the cheap plastic variety. Making this proved it. 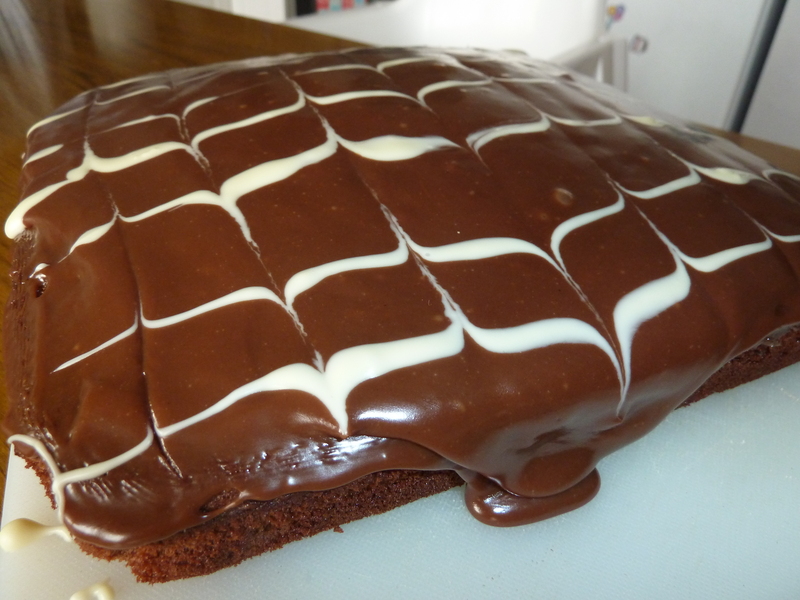 The chocolate cake itself was easy to make – just a standard, rich chocolate traybake. And because of my lovely new piping bag, it was also easy to decorate. And I really enjoyed the process of creating feather icing that wasn’t incredibly difficult to do! The cake also tasted great, which is of course a massive bonus. Again, there’s nothing particularly novel about this cake, but it does taste, and look, good – and is really easy to make. A relatively easy way to impress visitors, especially if they are chocolate fans! 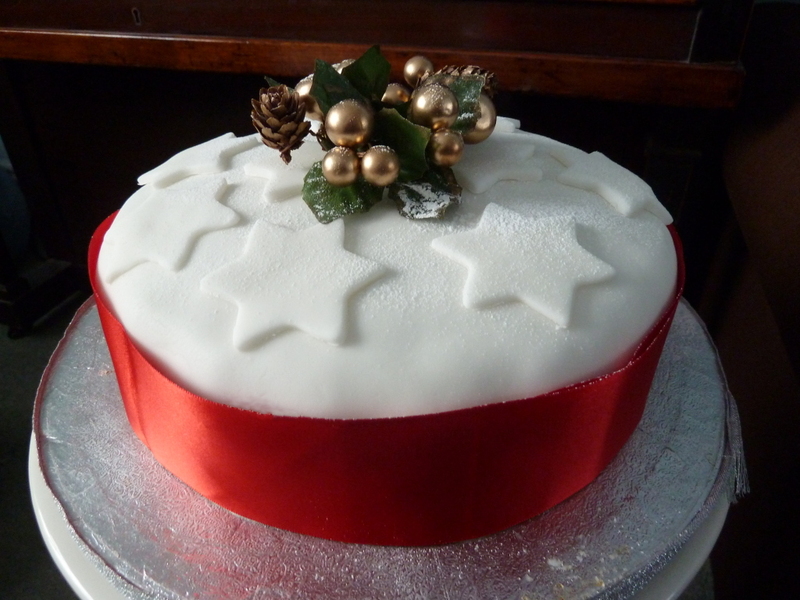 Every year Anna makes a tasty Christmas cake, in a variety of styles. This year we had the classic christmas fruit cake. Christmas cake just like your Granny makes it. This style of Christmas Cake is a bit bonkers to make. You start it in September, and feed it Brandy once a week like some strange creature under the stairs. This gets it good and moist and delicate, and probably keeping it sloshed stops it escaping in the middle of the night after tearing up the soft furnishings in the living room. Anyway, when its time you cover the whole thing in marzipan and then again in royal icing as the British have done since time immemorial. The main problem with this cake is that store bought ones are actually pretty good. There is a slight juiciness (and a real brandy hit) present here that you wouldn’t otherwise get, and for those of us who don’t want nuts in the cake its good to make one without. Of course, this cake tastes great if you like fruit cake, and it keeps forever so I can be merrily stealing slithers well into March if it’s not gone by then. A foresighted sort of chap like myself sees this as a great reason to make your own Christmas cake, preferably two sizes too large. Who made it: Anna did all the work, Dan helped with the decorations. Recipe: Mary Berry’s Ultimate Cake Book, page 91. Search for the recipe tag!